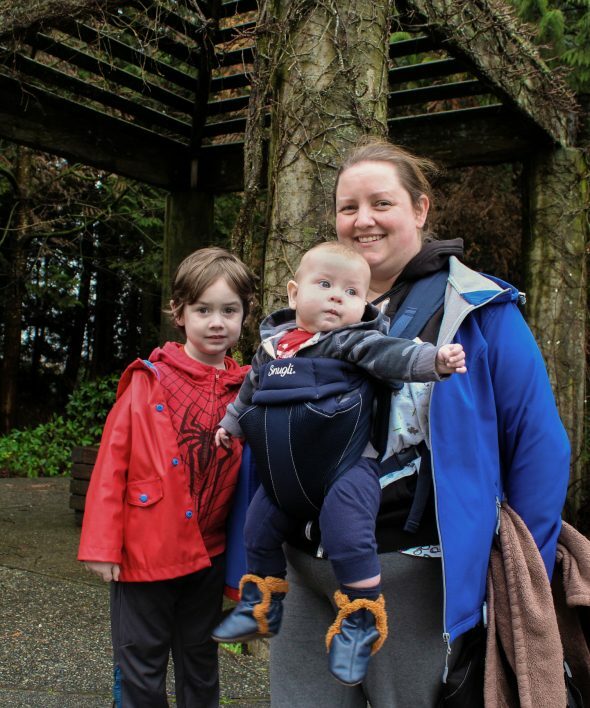 KPU creative writing student and mother of four, Tanya Burnstad, with her two young sons, four-year-old Jacob, and infant Logan (Ashley Hyshka). Between being enrolled at school, working part time, and covering the cost of ever-rising tuition fees, most of today’s university students live under considerable pressure. That pressure is even greater for those who have a child to care for at home. Data analyzed from 1976 to 2005 revealed that “between 11 and 16 per cent of post-secondary students had at least one dependent child,” according to an article in University Affairs. Once a quiet demographic, university students with children have become more vocal over recent years, demanding that universities listen to their needs. No student wants to be forced to choose between earning a post-secondary degree and caring for their children. For those who manage to do both, having access to additional resources on campus can make life a lot more manageable. Though there are relatively few resources available to parents attending class at Kwantlen Polytechnic University, the services and facilities provided by the University of Saskatchewan’s organization, Parents on Campus, are far more comprehensive. Kayla Madder, a graduate of the University of Saskatchewan (U of S), has Master’s degree in animal science and two Bachelor’s degrees in biotechnology and psychology. She’s also the mother of a little boy named Amari. While in her final semester, Madder became unexpectedly pregnant. She finished her degree while six months pregnant and then began her master’s program, completing her proposal meeting nine days after giving birth. After she returned from maternity leave, Madder, along with a friend who had also recently had a baby, tried to locate a place at the university where they could privately pump milk or breastfeed. The search turned up nothing, so Madder stopped breastfeeding on campus until she founded Parents on Campus in 2014 with Rita Hanoski, the health education coordinator at U of S.
She and Hanoski also created the U of S comfort rooms, which are private spaces for parents to care for their children while studying, eating, or relaxing. Other spaces for parents on campus offer services such as family friendly study periods, information sessions on relevant topics, and daycare sessions. While she understands that universities often have tight budgets, she feels that every institution should offer programs for student-parents. As a constituency, Madder says that students with children aren’t as vocal about their needs as others due to being exhausted, having hectic schedules, and fearing stigmatization. A third-year U of S student, Rachel Parkinson is obtaining her doctorate in biology while caring for her three-year-old son, Silvio. She says that she found balancing motherhood with her studies at U of S more difficult before the existence of Parents on Campus and the comfort rooms. She gave birth to her son before her final semester of her undergraduate program, got her Bachelor’s degree not long afterward, and began graduate school when her son was only nine months old. According to Parkinson, this high-stress time left her with very few days that she could spend on campus. She says that Parents on Campus has helped her be a more diligent, involved student at U of S since it was founded three years ago. Aside from an in-course bursary awarded to single parents, neither KPU or the Kwantlen Student Association offer any services or facilities for students with children. This issue worries current KSA President Tanvir Singh. “We definitely know that, by giving people access to childcare, people have a better ability to access their education than if they … had to spend out of pocket or go off campus for childcare,” he says. Singh says that the KSA would ideally be able to provide childcare to their constituents, but every time a councillor has tried to do so, there have been barriers too significant to overcome. Some of these include a lack of funding and available space on campus. The KSA President before Singh, Alex McGowan, worked with the university to brainstorm initiatives for childcare. One of these was for an offsite service which would provide KPU students and their children with subsidized care. Singh explains that this program fell short of expectations and has since been placed on the backburner, but he remains optimistic. With the new Surrey Central campus under construction at 3 Civic Plaza, expansions to the Surrey campus’s Spruce building, and the opening of the Wilson School of Design at KPU Richmond, the physical space across KPU campuses is expanding. This could help create more opportunities for services like a daycare in the future. For Tanya Burnstad, mother of four and second-year creative writing student, KPU’s lack of resources for parents has proven frustrating. After high school, Burnstad completed one year of university before taking time off to decide what she wanted to major in. During this hiatus, she became pregnant with her first child. She returned to university during the spring of 2016, but she and her husband decided to have another child. Afterward, she spent two more semesters carrying her youngest son, and gave birth to him two months after completing the spring 2017 semester. Burnstad is now taking two classes this semester while being a mother to her four young children. According to Burnstad, this has been an enormous and exhausting challenge. While she was a mother to three young children and pregnant with her fourth, she also juggled university studies and a full-time retail job. Because of her husband, her stable financial situation, and strong support from her family, Burnstad recognizes that she’s luckier than most parents enrolled in classes. Out of reluctance to use resources that a parent in a more difficult situation could benefit from, she has never contacted the university regarding childcare aid. Still, she has faced several challenges during her university career. Many of the courses she wants to enrol in take place in the morning, but due to the prohibitive cost of daycare, Burnstad would have nowhere to drop off her young children while at school. 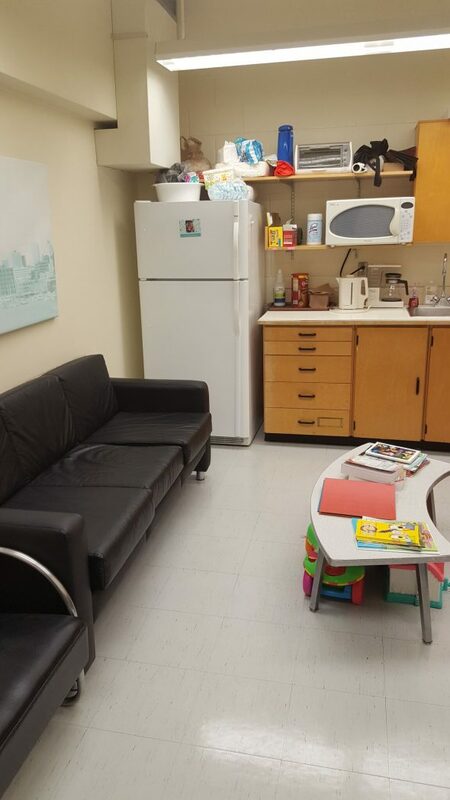 On-campus daycare and comfort rooms would be an invaluable resource at KPU. Although they’re a small demographic, student-parents at KPU still require help.